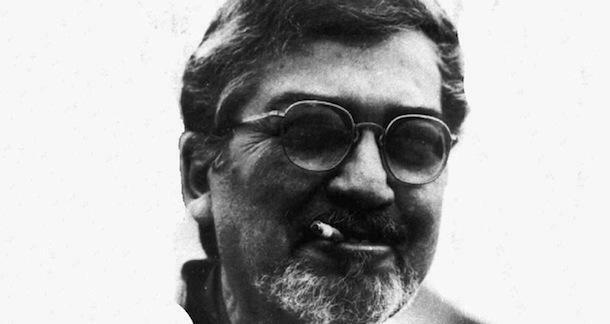 Alfred Bester is one of those icons of science fiction who isn’t widely known outside of genre enthusiasts, and yet he’s a writer who deserves more recognition. Though his output wasn’t as voluminous as some of his contemporaries, the works that he left behind are solid masterpieces of science fiction. The Demolished Man won the first Hugo Award for Best SF Novel. The Stars My Destination didn’t receive any awards, but is perhaps his most accomplished and appreciated work. Author Harry Harrison wrote, "Alfred Bester was one of the handful of writers who invented modern science fiction." In order to bring more attention to his works, here is a brief primer on some of Bester’s better works. The Demolished Man begins with Ben Reich, a well-to-do businessman with a grudge. In the Earth depicted in the novel, a subsection of the population, Espers, have telepathic skills. Espers are rated as 3rds, 2nds, or 1sts, and the lower the number, the more powerful (and rarer) the Esper. Telepaths, or peepers as they’re often called, are common in most aspects of business. So much so that Reich complains when in a store where he actually has to describe what he wants to shop for. The problem with this is that Reich is intending to commit murder. His longtime rival, Craye D’Courtney, has refused an attempt to merge their two companies, and Reich falls into a murderous rage. But how do you commit murder in a society where it’s common for peepers to look casually into one’s mind? How do you commit a crime when many of those around you can see it coming? Reich sets out to navigate this tricky situation, and this brings him into conflict with Lincoln Powell, an Esper and police officer. Powell has some problems of his own, one being that his non-married status (Espers must marry other Espers) is preventing him from moving up. As Powell and Reich come into contact, a chess game of moves and counter-moves begins. All of this occurs against a marvelous backdrop of a future society where plastic surgery abounds and people’s names are abbreviated with symbols (like @kins, or 1/4maine). But it’s the Esper society that sets this one apart, both in the extrapolations of how they affect society and in the ways that Bester simulates telepathic speech. There are plenty of typographical tricks used in the manuscript, something that seems bold and forward-thinking for the time. Without a doubt, this is my favorite of Bester’s work. Though it didn’t win the Hugo like The Demolished Man, The Stars My Destination (also known as Tiger! Tiger!) is a more personal work. Where The Demolished Man posited a world where telepathy was common, The Stars My Destination introduces a different ability—jaunting, the ability to teleport across distances of up to 1,000 miles. As one might expect, this has a significant, and sometimes violent, effect on society. Amidst this backdrop we find Gulliver “Gully” Foyle, a merchant marine who has been trapped in space aboard a lifeless ship, The Nomad, for 170 days. Bester tells us from the beginning that Gully is perfectly unremarkable, “the stereotypical Common Man” without any education, skills, or merits. No ambition. After 170 days of scrounging for air and living in what essentially is a coffin, Gully catches sight of another ship, Vorga-T:1339. Gully hits his derelict ship’s flares, expecting rescue. But the Vorga continues on, ignoring him. Gully swears revenge, vowing “Vorga, I kill you filthy.” The Vorga has awakened whatever lay dormant inside of Gully, no longer the Common Man. Lit by the desire for vengeance, Gully manages to make his escape and begins a long quest to get back at the Vorga and its owner, Presteign of Presteign, a true one percenter and head of a vast corporate empire. In this way, Bester presaged the rise of corporations in a way that the cyberpunks would later elaborate on. Of course, it’s not that simple because Presteign and his people want the location of the Nomad due to a secret cargo it was carrying. Like The Demolished Man, this results in a series of moves and counter-moves, and both sides work toward their ultimate goals. Make no mistake—Gully Foyle is a monster, willing to sacrifice almost everything in pursuit of his vengeance. But he is an adaptable monster, shaped by circumstance. He wears many masks, shedding one to take up another, continually honing his own weapon—himself. A must-read for anyone interested in science fiction. Bester is usually known for his two novels, but he also wrote numerous short stories. Some of them might feel dated since he was writing them in the 50s and 60s, but like most good science fiction, there are many that remain relevant. “Adam and No Eve” deals with a man whose rocket propulsion system has the unfortunate side effect of destroying all other life on earth and is a poignant and emotional story. “Time is the Traitor” deals with love and obsession and the effect that time has on ourselves and our relationships. Bester lightheartedly tackles time travel in “The Men Who Murdered Mohammed,” postulating a different theory than what you might expect. And “Fondly Fahrenheit” plays with the narrative, experimenting with POV in a way that helps underline the themes of the story. All of these stories and others can be found in the collection Virtual Unrealities. I’ll end on this lasting contribution from Alfred Bester, this time in the field of comics. Bester worked on titles such as Superman and Green Lantern and is credited with the Silver Age Green Lantern Oath which is still used today. Are you a Bester fan? Have you read any of his work? What’s your favorite? I'd love to hear from you in the comments.